Imagine going back in time to the samurai era, stepping into a real samurai mansion and changing into hakamas. You learn about the bushido, the way of the warrior, and the art of zen. Then it’s finally your turn to wield a katana. Your thoughts are running at a hundred miles per hour because this is your first time holding this kind of weapon. How do you use this? Am I strong enough? You remember your Zen practice, what the samurai used to quiet their minds during battle. Now it’s time to cut through a bamboo mat, you feel powerful as you slice through the layers of the post. The era of the Samurai has ended decades ago but the lineage and history are still carried on until today. We visited Kyoto Samurai Experience to channel our inner warriors and learn about key history in Japan. 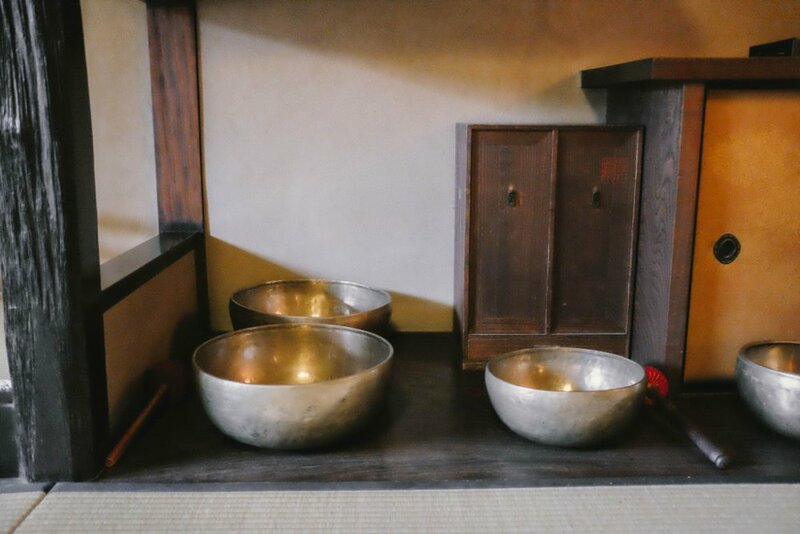 We began our experience by entering a 250-year-old home owned by a samurai. The doors were small to prevent attacking samurai to enter with their swords sheathed. It is a natural defensive design choice. The artwork and gold paint on the walls were preserved and gleamed with prestige. We were dressed in hakamas, traditional samurai clothing by the hosts so that we could truly look the part. In the first room, real samurai armor was displayed without protective glass blocking it. It was surreal to see the armor so up close and personal. Next, they gave us a history of the samurai and how they came to be. The samurai were motivated by defensive reasons. They practiced their skills so that they could protect themselves, only when the situation arose. When the situation did come, the wanted to end the fights as soon as possible. It is very unlike the movies in Hollywood where samurai battles are drawn out. Samurai actually intend to end fights within one slash of their blade. We moved on to the second and third room, which opened into a beautiful garden. We sat cross-legged on pillows and were introduced to the katanas, the samurai swords. Katanas were considered the soul of the samurais and had a special connection with their owner. We experienced some Iaido (martial art) movements up close and you can definitely see and feel the focus and power that was integrated with every move. After this performance, we stepped outside in the garden to watch the Goza mat cutting. These are used to practice using swords because they are very similar to the density and fluidity of human flesh. Within a split second, the swordsman sliced the bamboo in 3 different places at a sharp straight angle. Everyone took turns, we did a practice swing and then were prompted to “let the sword cut it for you”. I swung and sliced through half of the mat, but it still felt unreal holding a katana! Andy made a clean cut his first try and the instructors were very impressed. After this high-intensity activity, we stepped back into the house. The other aspect of the samurai lifestyle is to balance it with Zen meditation. Samurai focus on physical prowess as well as meditation so that they can stay in control in times of duress. This allows them to make quick, efficient decisions by doing the least amount of harm. We sat with our eyes half open and focused on emptying our minds. The host played a simple sound on bowls to aid us in this process. Once that was done, our experience was complete. We were given an opportunity to ask the guide any questions and had plenty of time to take photos in the house. It was truly an amazing experience that I would recommend to anyone visiting Kyoto. Thank you, Kyoto Samurai Experience!